JUNE 5, 2015 - A South Coast League schedule that has the defending champion Triton Varsity playing each of its league rivals in away games during the first half of league play before hosting each of them in the second half is the highlight of the 2015-16 Triton Basketball schedules which were released this week. It was the earliest general availability of schedules in program history, beating last year's previous best by more than a month. San Clemente's varsity and J.V. will open league play on January 8 at Dana Hills, then have SCL games at Mission Viejo (January 13), at Aliso Nigule (January 15) and at El Toro (January 27). This means the Tritons' upper divisions will host each game in the second half of league play, culminating with the regular-season finale on Senior Night, February 11, against Dana Hills. The lower division teams will play at the opposite venue for each league game. The season gets underway on Saturday, Nov. 14, when all levels scrimmage at Trabuco Hills. Then the varsity will play its annual alumni game on Thanksgiving eve, Nov. 25. Games that count in the record book begin on November 30 with the Triton Varsity (Diablo Inferno), Junior Varsity (Fountain Valley) and Soph (Capistrano Valley) in tournament action. The Frosh don't begin play until December 2 in the Dana Hills Tournament. Home openers for the varsity, J.V. and frosh are on December 10 when they host Woodbridge. The sophomores do not play at home until January 5 when Troy visits. Other varsity tournaments are at the Irvine World News and Estancia/Tustin events. El Toro and Dana Hills will host the other J.V. tournaments on the Triton schedule. For the sophomores, they will go to the Fountain Valley and Laguna Hills tournaments. The frosh will round out their tourney schedule at Laguna Hills and El Toro, while the frosh B will play in multi-day events at Mission Viejo and Northwood. Additional non-league foes for the Triton Varsity will be Oceanside in the OC/SD Challenge and Valencia in the North OC/South OC Challenge and Troy, as well as San Juan Hills and Tesoro in Coast View Athletic Conference (CVAC) crossover games. The CVAC is comprised of the South Coast and Sea View leagues. Lower division non-league games vary, depending on whether the varsity opponent has a team in each division. March 7, 2015 - As remarkable as the Triton Varsity's 2014-15 season was, a post mortem analysis of the team's schedule shows the Tritons' accomplishments may be even more noteworthy than previously recognized. Of the 23 California-based opponents played by San Clemente, 18 of them qualified for the CIF-Southern Section Playoffs. Two of the four out-of-state teams faced by the Tritons during a December tournament made it to their respective state's playoffs. In total, 20 of the Tritons' 27 opponents this season were playoff teams. Foremost among these is Xaverian (Brooklyn), ranked second in the State of New York and at this writing preparing to play for the state title. Canyon (2AA) and Sonora (3AA) both won CIF Southern Section championships. Corona del Mar lost in the 3A title game. Tustin (1AA), Tesoro (1A) and Esperanza (3A) all made it to the semifinals. All but three of the playoff teams faced by the Tritons this season went at least to the second round. And a non-playoff team on the San Clemente schedule, rival Dana HIlls, whose fourth-place finish in the South Coast League kept it out of the postseason, posted a victory over 2AA finalist Elsinore. Junior guard Jake Cameron and sophomore guard Blake Birmingham have been promoted to the Triton Varsity for the team's CIF-SS 1AA playoff run. Cameron and Birmingham were the leading scorers on this year's 21-3 junior varsity squad. And Cameron is no stranger to varsity action, having played a handful of games with the team early this season, when the varsity found itself shorthanded due to injuries and a number of players still participating in football playoffs. He averaged five points per game during that stint. Birmingham also saw some varsity action, playing in the pre-season scrimmage against Trabuco Hills and in the alumni game. FEB. 6, 2015 - While the Triton Varsity was making team history by winning its second league title in three years, three members of the squad also were achieving an individual milestone. 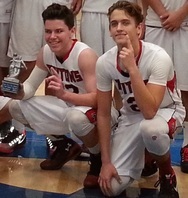 Seniors Nick Crankshaw and Sam Darnold along with junior Cole Fotheringham became the only players in Triton Basketball history ever to win two league championships during their San Clemente High School basketball careers. 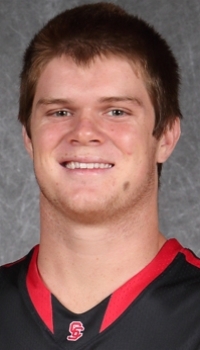 As a sophomore, Darnold was most valuable player of the 2012-13 San Clemente team which won the Sea View League title, the school's first boys' basketball championship since 1975 and only its second ever. 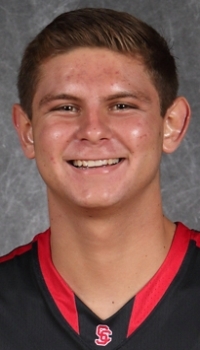 Crankshaw, also a sophomore at the time, was the sixth man in 2012-13. 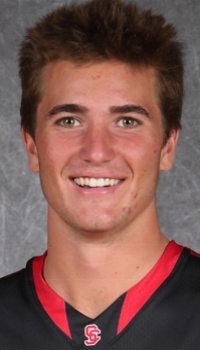 And Fotheringham was a regular in the rotation as the lone freshman on that squad.